Light/dark transition test & Conditioned place preference test | O’HARA & CO.,LTD. 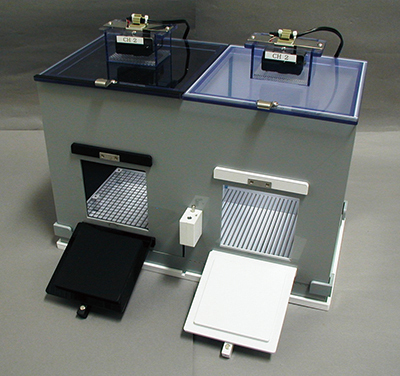 With added components, you can perform two types of experiments in this apparatus: light/dark transition test (2 compartments) or conditioned place preference test. In the light/dark transition test, one option is to customize the slide door connecting the two compartments to be automated and controlled by the software. 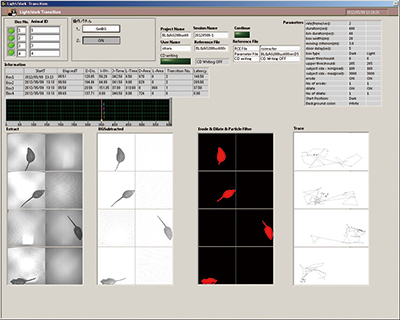 Furthermore, the ceiling of each compartment has CCD camera in which images are analyzed by the software to measure the subject’s movement within each compartment. In addition to number of entries and cumulative duration parameters, distance traveled within each box can also be measured. In conditioned place preference test, the light/dark compartments are recommended to be placed in sound-attenuating chambers. This entry was posted in Products and tagged drug dependency, emotionality on 7月 23, 2015 by admin.